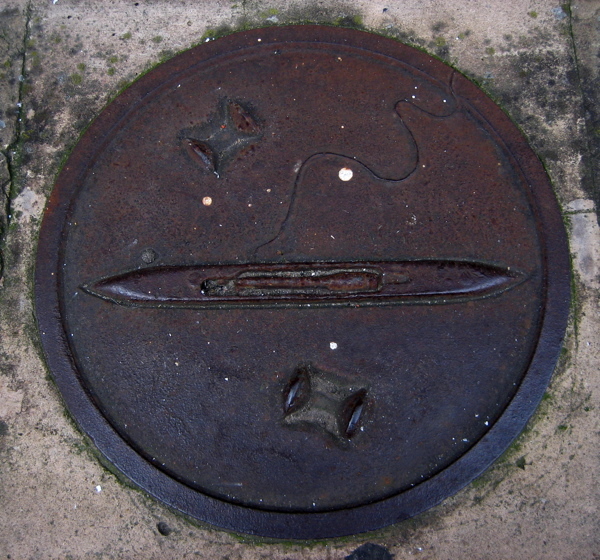 Around the streets of Spitalfields there are circular metal plates set into the pavement. Many people are puzzled by them. 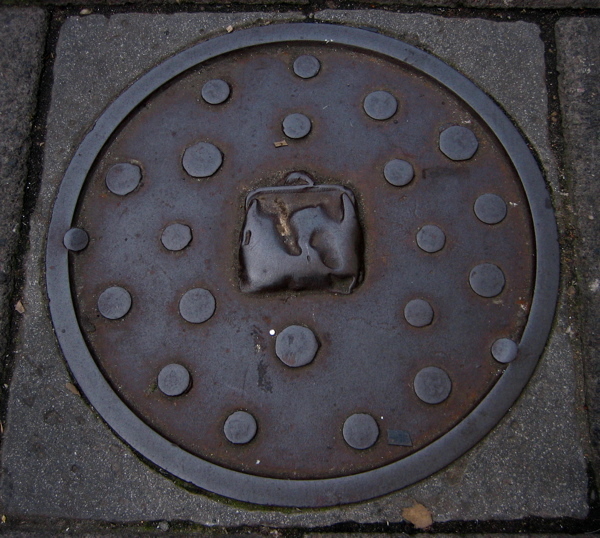 Are they decorative coal hole covers as you find in other parts of London? Or is there a mysterious significance to them? 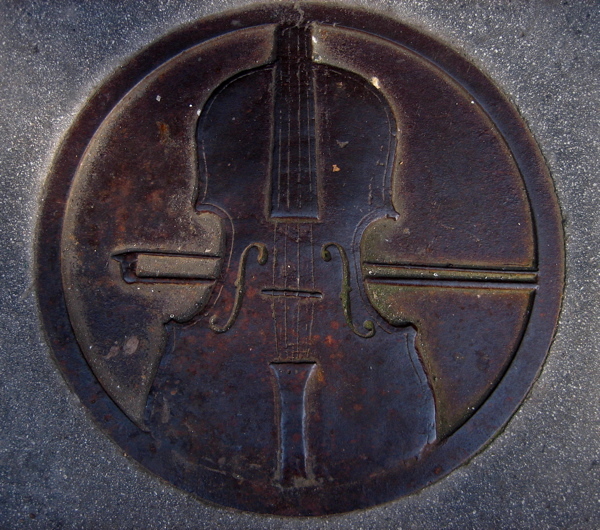 Sculptor Keith Bowler was walking down Brick Lane one day when he heard a tour guide explaining to a group of tourists that these plaques or roundels – to give them their correct name – were placed there in the nineteenth century for the benefit of people who could not read. Keith stuck his neck out and told the guide this was nonsense, that he made them on his kitchen table a few years ago. And although the tour guide gave Keith a strange look and was a little dubious of his claim, this is the truth of the matter. “I was approached by Bethnal Green City Challenge in 1995, and I was asked to research, design and fabricate twenty five roundels. I was given a list of sites and I spent a few months doing it.”, explained Keith summarily, as we sat at the famous table where he cast the moulds for the roundels in the basement kitchen of his house in Wilkes St. Keith cut the round patterns out of board and then set real objects in place on them, such as the scissors you see above. From these patterns he made moulds that were sent over to Hoyle & Sons, a traditional family-run foundry in the Cambridge Heath Rd, where they were cast in iron before being installed by council workers. The notion was that the pavements were already set with pieces of ironwork, making this a natural context to introduce pieces of sculpture, and the emblems and locations were chosen to reflect the diverse culture and history of Spitalfields. 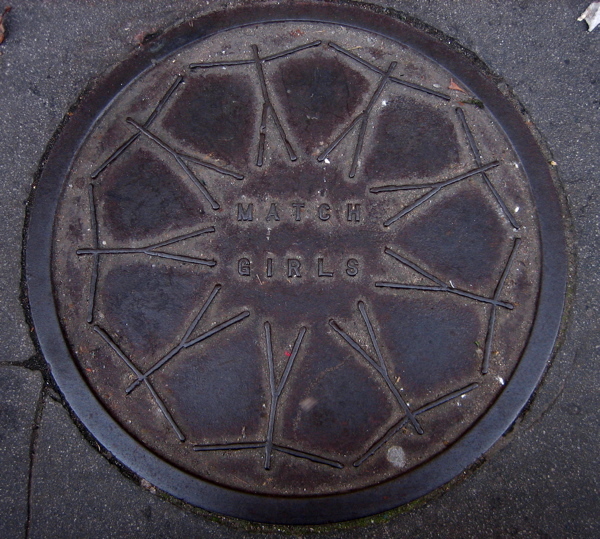 Sometimes there was a literal story illustrated by the presence of the roundel, like the match girls from the Bryant & May factory who met in the Hanbury Hall to create the first trade union. Elsewhere, like the scissors and buttons above in Brick Lane, the roundel simply records the clothing industry that once existed there. At first there were interpretative leaflets produced by the council which directed people on a history trail around the neighbourhood, but these disappeared in a few months leaving everyone to create their own happy interpretations ever since. The roundels have acquired a history of their own. For example, the weaver’s shuttle and reels of thread marking the silk weavers in Folgate St were cast from a shuttle and reels that Dennis Severs found in his house and lent to Keith. 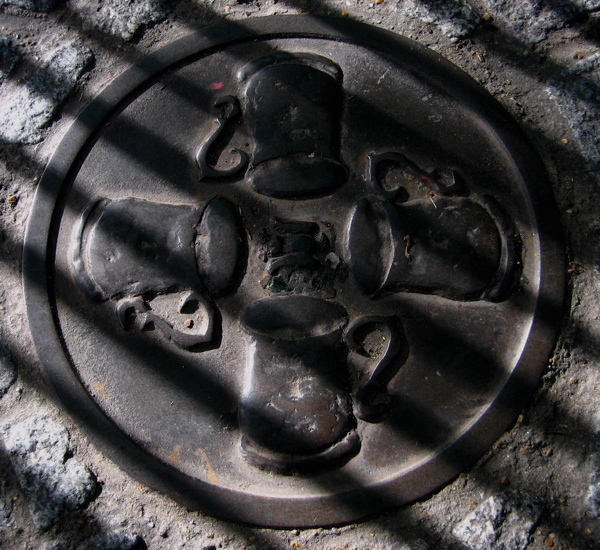 And there was controversy from the start about the roundels, when two were mistakenly installed on the City of London side of the street in Petticoat Lane and at at the end of Artillery Passage in City territory, leading to angry phone calls from the Corporation demanding they be moved. Six are missing entirely now, stolen by thieves or covered by workmen, though occasionally roundels turn up and wind their way back to Keith. He has a line of errant roundels in his hallway, ready to be reinstalled and, as he keeps the moulds, plans are afoot to complete the set again. Keith told me he liked the name “roundels” because it was once used to refer to the symbols on the wings of Spitfires, and is also a term in heraldry. There is an elegant austerity to these attractive designs that I walk past every day and which have seeped into my subconscious, constantly reminding me of the history that surrounds me, and witnessing the presence of what has gone. Keith is planning a book of photographs, explaining the background to each of his roundels – to delight the curious and prevent any further confusion among tour guides. But in the meantime, I photographed half a dozen of my favourites to show you, which you can see below. Now keep your eyes open, because there are at least eight more roundels still to be found on the streets of Spitalfields. 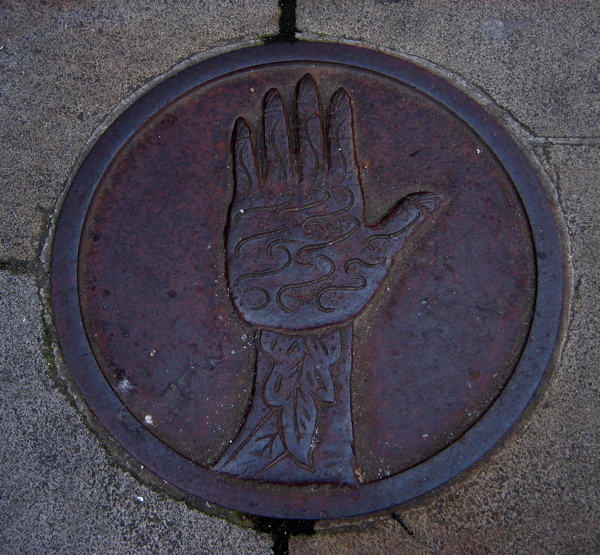 On Brick Lane, among the Bengali shops, a henna stenciled hand. Commemorating the Bryant & May match girls, outside the Hanbury Hall on Hanbury St. In Folgate St, cast from a shuttle and reels from Dennis Severs’ House. In Brick Lane, outside the railings of Grey Eagle Brewery. In Princelet St, commemorating the first Jewish Theatre, where Jacob Adler once played. In Petticoat Lane, on the site of the ancient market. 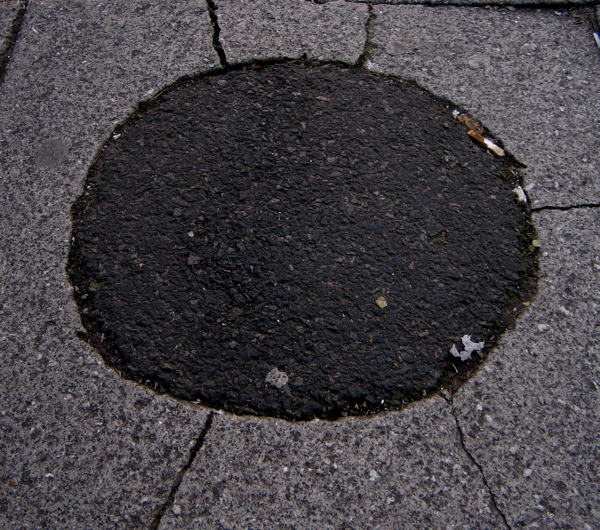 In Wentworth St, an over-vigilant council worker filled in this roundel as a potential trip hazard. They have a wonderful timeless quality, don’t they? Spare modern lines combined with a heavy iron patina of age. I was checking out some sites today and couldn’t find the roundel outside Dennis Severs house and indeed the staff there knew nothing about it! anyone got any idea what has happened to it please? also on the off chance anyone has any information -there are some initials on the corner house of Bell lane BSC or some combination; I have wondered for ages about their meaning but again I cant find any information about these so if you do know would really appreciate this. The creative covers are fascinating because they visually embody the history of the area. 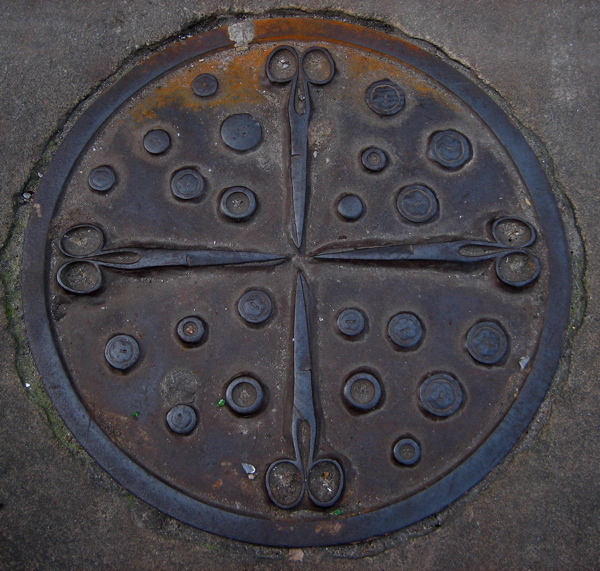 Michelle Ward made me aware of these covers on her 2016 blog:October Manhole Madness. Would you give me permission to put excerpts and photos on my blog?